In the world of modern tyres it is common place to come across a tyre test. However in the world of classic tyres the investment never seems to be there to do a proper modern tyre test. However a German magazine in July 2016 conducted this modern tyre test using classic tyres. This classic tyre test has been translated from German to English. What is remarkable in this tyre test is quite how well the PIRELLI CINTURATO ™ CN36 classic tyre performed in the table at the end. The scores in this table are not scored in relationship to the other tyres in the test, so when a score of 1 is recorded, then that is a perfect score for a classic tyre or a modern tyre. It is wonderful to see that these classic PIRELLI CINTURATO ™ CN36 tyres can give such exemplary results. 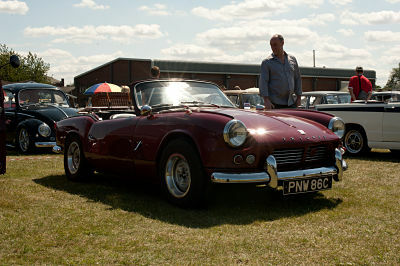 Built between 1962-1980, the Triumph Spitfire was a small two-seater sports car based on designs by Giovanni Michelotti and made to compete with the Austin-Healey Sprite. There were five different models of the Spitfire over its lifetime, the Triumph Spitfire 4/Mark I (1962-1964 - 45,753 Built), Spitfire 4/Mark II (1964-1967 - 37,409 Built), Spitfire Mark III (1967-1970 - 65,320 Built), Spitfire Mark IV (1970-1974 - 70,021 Built) and Spitfire 1500 (1974-1980 - 95,829 Built).